Did PSP Gaming Result In Japan's Big Soccer Wins? This weekend, Japan's "Samurai Blue" soccer team beat Australia to win the Asia Cup. Pundits are pointing to the team's young players and new coach, Alberto Zaccheroni. But there might another reason for their chemistry — perhaps, like Monster Hunter. Like many athletes (and Japanese people, for that matter), Samurai Blue players enjoy playing video games on their handheld game machines. While Sports Hochi does not explicitly say "Monster Hunter", it does say that between six and eight players all get together in their lodgings for co-op play and to take out "dinosaurs and whatnot". So the game is either most likely Monster Hunter or God Eater, both popular games for portable game machines in Japan. 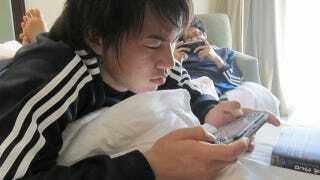 However, pictures surfaced, showing team members playing Monster Hunter. Star player Keisuke Honda began joining for these co-op gaming sessions, and it seems as though it resulted in him changing his attitude. Before, he was very much a "me first" type of player and person, but since became more of a team player. Monster Hunter focuses on co-op play, leading Japanese soccer fans to wonder if communication created in the virtual world is finding its way onto the soccer field.